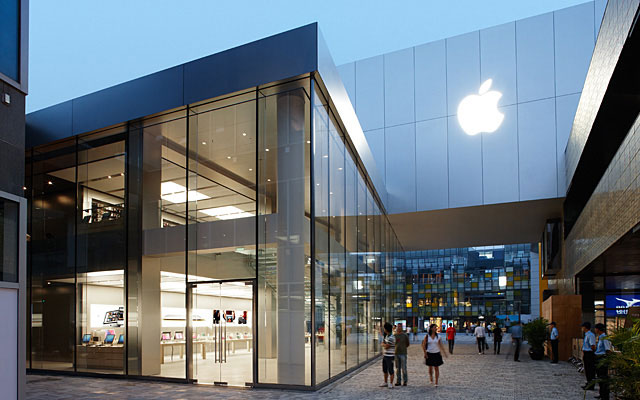 Apple is set to open five new Chinese outlets in the next five weeks as the company prepares for an influx of shoppers during the Spring Festival, retail chief Angela Ahrendts revealed this week, with four of those outlets in cities that do not currently house an Apple Store. "We are opening five new stores before the Chinese New Year this year. Four of the stores are in brand new cities for us," Ahrendts said to state-owned news agency Xinhua. That follows CEO Tim Cook's commitment last October to open 25 new outlets in the next two years. Ahrendts noted that meeting demand while maintaining Apple's current standard of customer service will be a challenge, especially given the massive number of consumers in the Chinese market. The company's current flagship store in Shanghai is the busiest in the world— outpacing even Apple's well-known Fifth Avenue location in New York— drawing over 25,000 visitors each day. The former Burberry CEO also revealed some interesting data about Apple's sales infrastructure in China. The company now has more than 3,700 retail employees in the Greater China region, which includes Taiwan and semiautonomous Hong Kong, a number that has grown by 75 percent since 2012. Apple's online store shows strong growth as well, with an 80 percent increase in sales last year. "The fastest growing store for us is the Apple Online Store in China," she said.